The retail slugfest that is Black Friday is almost upon us, and several stores are eager to get in a few punches before the bell. 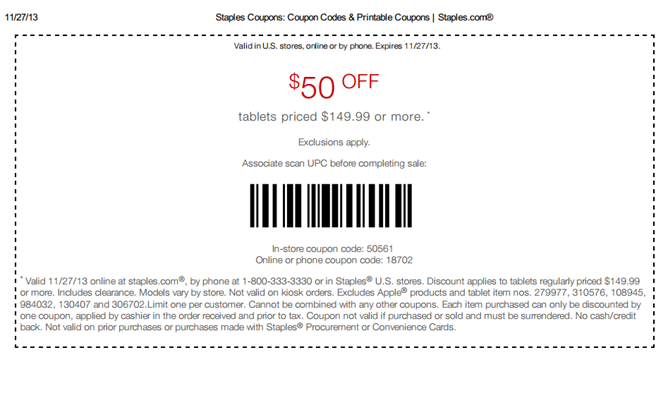 That includes Staples, which is reviving its well-received $50 off tablets coupon from earlier this year. The coupon is valid online, in stores, or over the phone (people still shop over the phone?) but it will expire after today, November 27th. Of course there are a few stipulations. 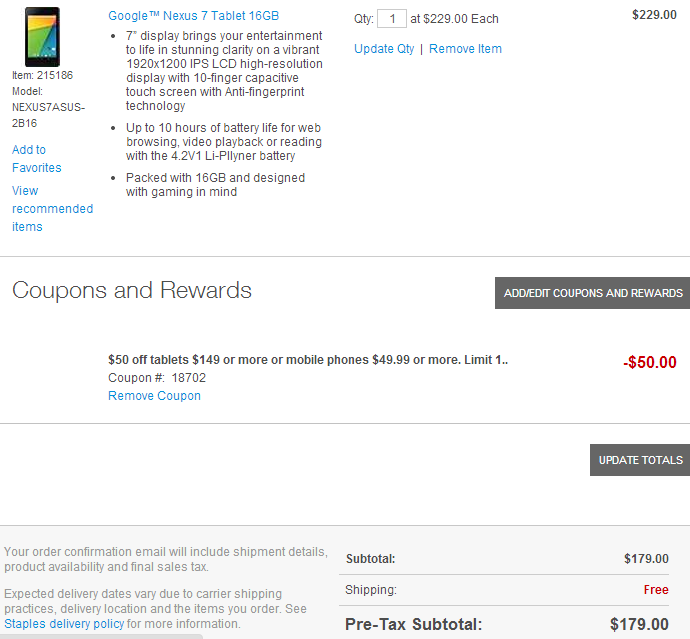 First and foremost, the discount can only be applied to tablets with a regular price of $150 or more. The discount doesn't apply to Apple products, the Kindle Fire line (including the new HDX), the Microsoft Surface, plus this Acer Iconia A1 and this ASUS MemoPad ME102. I'm guessing that the Apple, Microsoft, and Amazon tablets are limited to certain prices by manufacturer agreements, and the other two are so low-margin that Staples needed to make the exception. Even so there are plenty of notable tablets still available, including ASUS and Samsung models covering a wide gamut of prices and capabilities. The Nexus 7 2013 WiFi and LTE is offered at retail price, so the discount brings it down to $180, $220, and $300 for the 16GB, 32GB, and 32GB LTE models, respectively. The Nexus 10 32GB is already discounted by $100, so the final price after applying the coupon is $350 - not bad at all. The best deal to be had if you're not overly concerned with hardware is probably this brown Galaxy Tab 3 7.0, which is just $109.99 after the coupon discount. Using the online coupon code 18702 is probably your best bet to score a discounted item - Staples retail stores tend to have pretty limited tablet stock. On the other hand, there's nothing stopping you from ordering one online and buying one in the store, or multiple stores for that matter. 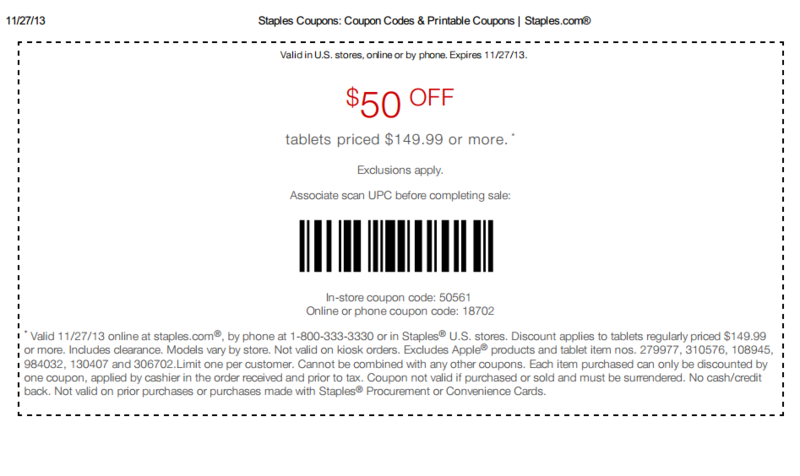 The link to Staples' coupon page below has the full-sized version for printing, but here's the tiny type just in case you wanted to see it. Valid 11/27/13 online at staples.com®, by phone at 1-800-333-3330 or in Staples® U.S. stores. Discount applies to tablets regularly priced $149.99 or more. Includes clearance. Models vary by store. Not valid on kiosk orders. Excludes Apple® products and tablet item nos. 279977, 310576, 108945, 984032, 130407 and 306702.Limit one per customer. Cannot be combined with any other coupons. Each item purchased can only be discounted by one coupon, applied by cashier in the order received and prior to tax. Coupon not valid if purchased or sold and must be surrendered. No cash/credit back. 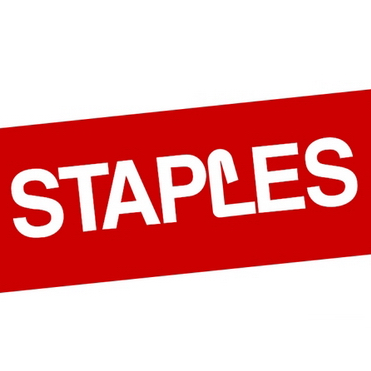 Not valid on prior purchases or purchases made with Staples®Procurement or Convenience Cards. 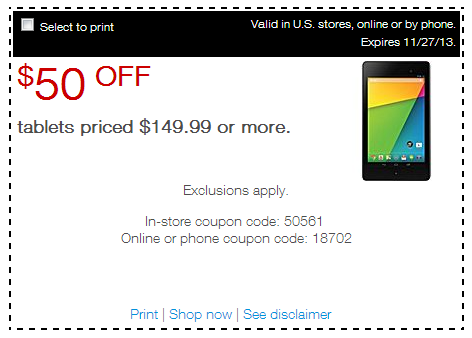 Update: Staples is being somewhat inconsistent with its discounts - some tablets that are already discounted won't let you apply the coupon (like the Galaxy Tab 3) and some will (like the Nexus 10).